Pomegranates are an extremely healthy fruit, but some people may struggle to fit them into a diet. With these recipes, the struggle is over! If you want to eat more superfoods like pomegranates, we’ve got three simple recipes that will blow your mind! Pomegranates are surprisingly healthy fruits that you may not have tried, or if you have, it may have been as a juice or hidden in a larger recipe. With the many health benefits of this fruit, pomegranates are an ingredient you should be taking advantage of. Today, we’re serving up three different, simple recipes that utilize this superfood to its fullest extent. You may even start adding pomegranates to your regular grocery list! 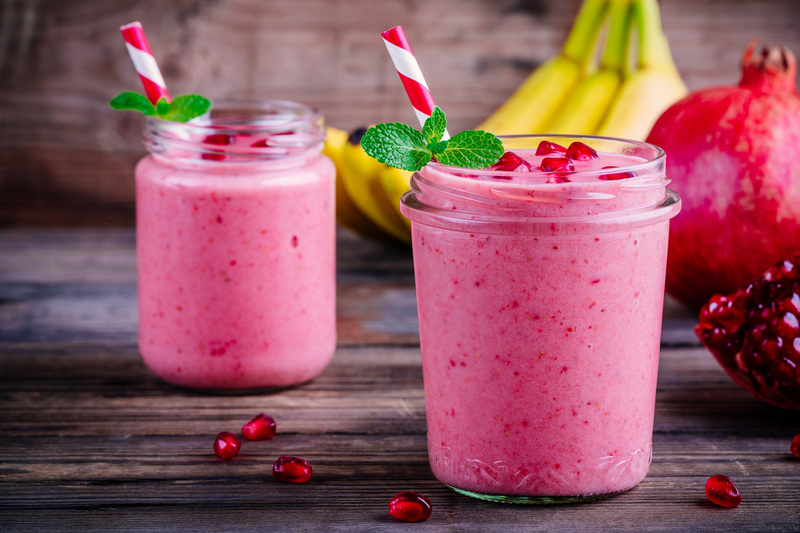 Smoothies are one of the easiest ways to add superfoods to your diet. That’s true for pomegranates, bananas, kale, and a host of other fruits and vegetables. This recipe pairs blueberries, a banana, and a pomegranate for a sweet, but filling (and healthy), breakfast option you can whip up for two in a flash! Blend the nonfat Greek yogurt and pomegranate juice together until they’re thoroughly mixed. Add the banana slices, frozen blueberries, and blend until smooth. If it’s at the texture you enjoy, then serve! You can also add ice cubes to the mix and blend for a frozen smoothie, which is perfect on a hot day! Simply add ice and blend until it’s at your desired texture. Pomegranate’s tangy flavor makes it perfect as a counterpoint to savory or fresh-tasting dishes. For this pesto chicken, it’s the exclamation mark on an already stellar entrée. It’s also a versatile main course that can be paired with an assortment of sides, like vegetables, starches, or salads, to make a complete dinner. Add fresh basil leaves, pine nuts, parmesan cheese, diced garlic, and olive oil to a food processor. Pulse until it’s reached the desired texture. Pulse less for coarser and creamier pesto. In a resealable bag, mix pomegranate seeds into the pesto. Lightly season the chicken breast with salt and pepper. Place the chicken in the bag of pesto and shake to completely cover the chicken. Marinade chicken in the fridge for at least an hour, or you can leave it overnight. Place a baking rack on a tin-foil-covered baking sheet. Put the pesto chicken on the baking rack. Bake for 20 to 25 minutes. Check after 15 minutes and rotate the baking sheet. Remove from the oven and check the internal temperature of the chicken. It should be 165° F.
So, we have a smoothie and an entrée. Now, we’ll follow it up with a salad, so you can have a full pomegranate meal! This salad takes shaved Brussel sprouts, with its unique crunch, and pairs it with a homemade, healthy Pomegranate vinaigrette and bacon bits. Whether this is a side salad or the star of your meal, you’ll love it! Add the white wine vinegar, ¼ cup of pomegranate seeds, Dijon mustard, and (optionally) honey into a blender to start making the vinaigrette. Blend at a medium speed. Slowly add the olive oil, as the blender runs, by pouring it into the opening of the blender’s lid and mix for about 20 seconds. Using a mandolin, shred the Brussel sprouts and place the shaved sprouts into a large bowl. You can also blend the sprouts in a food processor if you don’t have a mandolin. Mix in the remaining ¼ cup of pomegranate seeds and dress the salad with as much, or as little, vinaigrette as you want. In a skillet, cook over medium heat until the bacon is crisp. Allow it to cool. Once it has cooled, crumble the bacon into bite-sized bits and combine in the salad. With two large spoons, toss the salad, so the dressing has even coverage.